In a clinical trial of 677 patients with moderate to severe AD on stable AChEI* therapy, adding NAMENDA XR® (memantine HCl) extended-release capsules 28 mg was statistically significantly superior to placebo+AChEI at 24 weeks (using an LOCF† analysis) in the co-primary endpoints of cognition, as measured by the SIB‡ (2.6 unit mean difference) and global function, as measured by the CIBIC-Plus§ (0.3 unit mean difference). In a subset population, 464 patients (68% of the overall study population) who received a stable dose of donepezil HCl 10 mg were randomized to receive either NAMENDA XR 28 mg or placebo. Improvements observed in the subgroup of patients taking NAMENDA XR 28 mg+donepezil HCl 10 mg (2.7 unit mean change in SIB and 0.3 unit mean change in CIBIC-Plus) were similar to those observed in the overall study population at 24 weeks. A pharmacokinetic study demonstrated the bioequivalence of NAMZARIC compared with coadministered NAMENDA XR 28 mg and donepezil HCl 10 mg. There is no evidence that NAMZARIC prevents or slows neurodegeneration in patients with AD. *AChEI=acetylcholinesterase inhibitor. AChEIs studied in this trial were donepezil, galantamine, and rivastigmine; †LOCF=last observation carried forward; ‡SIB=Severe Impairment Battery; §CIBIC-Plus=Clinician’s Interview-Based Impression of Change Plus Caregiver Input. 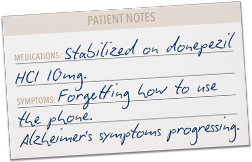 NAMZARIC (memantine and donepezil hydrochlorides) extended-release capsules are indicated for the treatment of moderate to severe dementia of the Alzheimer’s type in patients stabilized on 10 mg of donepezil hydrochloride once-daily. NAMZARIC can cause diarrhea, nausea, and vomiting. Although in most cases these effects have been mild and transient, sometimes lasting one to three weeks, and have resolved during continued use of donepezil hydrochloride, patients should be observed closely at the initiation of treatment. Cholinomimetics, including donepezil hydrochloride, are believed to have some potential to cause generalized convulsions. However, seizure activity also may be a manifestation of Alzheimer’s disease. For patients with severe renal impairment (creatinine clearance 5-29 mL/min, based on the Cockcroft-Gault equation) stabilized on donepezil hydrochloride 10 mg once daily and not currently on memantine hydrochloride, the recommended starting dose of NAMZARIC is 7 mg/10 mg taken once a day in the evening. The dose should be increased to the recommended maintenance dose of 14 mg/10 mg once daily in the evening after a minimum of one week. Complete the form below to share the NAMZARIC website with a colleague. A link to the website will be included in your message. 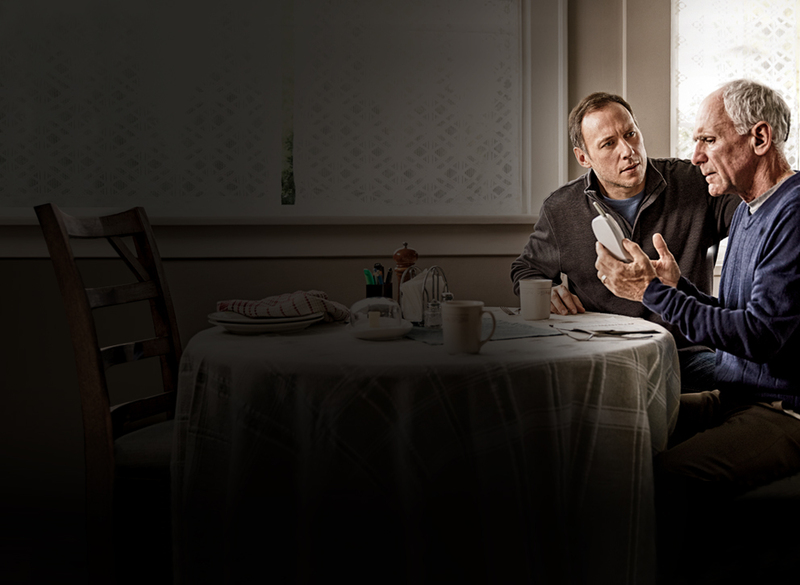 Complete the form below to share the Free Trial Offer with a patient or caregiver. A link to the website and Trial Offer PDF will be included in your message.